Do you run a logistics company or work in the transport field? If so, you’ll be all too familiar with the challenges faced by workers in these fields every day. The ordered goods must be shipped, no matter how bad the weather conditions. The saying “There’s no such thing as bad weather, only unsuitable clothing” is particularly fitting. Promotional work wear is thus, perfect for the field of shipping, transport and logistics. Our clothing for professionals will meet and exceed all the expectations you have with regard to ADLER as a promotional item wholesaler. We know how important it is to achieve the right effect with your promotional article with custom print. With the support of our work wear specialists on all aspects of promotional items for transport, logistics and related industries, you will quickly find a gift that you might never have thought of in connection with your new concept! Should you integrate occupational safety into promotional activities? When designing logos for your promotional gifts, you should leave nothing to chance and plan carefully. Anything is possible, whether a small logo for safety glasses or a special logo for promotional anniversary gifts. Here at ADLER we guarantee that your logo will always look great. No matter if it printed on bags or work wear. And if you are interested in promotional clothing items for transport and logistics, you’ll be glad to hear that these days, adhering to occupational safety standards no longer means shapeless, drab work wear. Adhesive tape, pocket knives, key rings, etc. It cannot be emphasised enough how important company wear – and this is not limited to classic uniforms – can be, and indeed should be, for your company’s public image. For example, promotional gifts from the ADLER for the logistics field featuring your logo and slogan could become real fan items if you select a hip, creative personalisation, graphic or message. Studies regularly show that you can increase customer loyalty by presenting your customers with high-quality, practical promotional items. Word has certainly gotten out in the logistics and transport sector that teamwear and promotional gifts are great for business. The same is also true for freight forwarding companies. 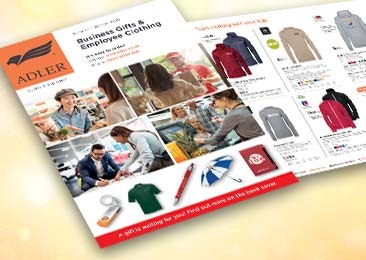 Promotional items can turn your company employees into walking advertisements – when you take advantage of the extensive knowledge and comprehensive service provided by our experts when designing your promotional clothing. ADLER Business Gifts: advertise your logistics business cheaply and effectively. After browsing our wide range of promotional items, you can design and order the ones you like best. Whether you are looking for cleaning agents for your company, want to design fan merchandise featuring your logo (e.g. caps, shirts or other textiles), or just generally want to increase your company visibility: our professional customer consultants will, after discussing your needs, advise you on which promotional items will help you achieve the desired outcome efficiently and at a reasonable price.